I had a very strange experience this morning! 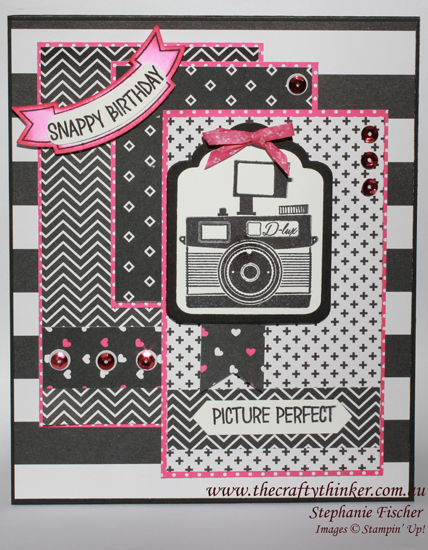 I was quickly flicking through my social media when I was stopped in my tracks by a very familiar-looking card using the Pun Intended and Thoughtful Banners stamp sets and Pop of Pink DSP. It was very confusing because whilst I had made and photographed my card, I knew that I hadn't yet posted it anywhere! Then I looked again, saw the subtle differences and realised that Bille Moan and I are clearly on the same wavelength because it was her card that I was looking at, not mine! So then I was in a quandrary - do I still finish and publish my post or not?! As you can see - I decided to post. If at least two of us have had a similar idea at the same time, it must be a good idea - right?! The layers are all Pop of Pink DSP. The stamp set is one of the new hostess sets - Pun Intended - stamped in Basic Black onto Whisper White cardstock. The camera panel and Basic Black Matt for it are cut with two of the Tags & Labels framelits. I trimmed the end of a dark strip of DSP with the Banner Triple Punch and stuck it to the back of this layer. The Picture Perfect greeting was stamped onto a narrow strip of Whisper White cardstock and then I used one of the Project Life Cards & Labels framelits to trim each end (separately). I stamped two of the banners from the Thoughtful Banners stamp set, curved the greeting Snappy Birthday to fit and stamped it into one of the banners. I hand cut just inside the lines of that banner and then trimmed the ends to a bit of a curve. The other banner I cut with the matching punch (I bought both as a bundle and saved 10%), sponged with Melon Mambo and then attached the greeting. The picked out some pink sequins from the Brights Sequins Assortment and adhered three of them directly to the top panel (which is more white than black) with the Fine Tip Glue Pen. I stuck White Perfect Accents onto the panels that were more black than white and then used the Fine Tip Glue Pen to stick the sequins (upside down) to the top of those white accents. I felt the sequins would get lost if I glued them directly to the dark DSP. I didn't have any Melon Mambo ribbon, although I thought I did! I really wanted to add a Melon Mambo bow above the camera. So I broke off a length of Pop of Pink washi tape, folded it into a very narrow strip and made a bow with that.